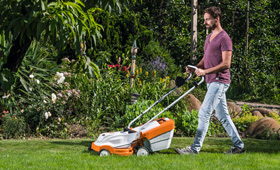 Lightweight and manoeuvrable cordless lawn mowers from the COMPACT cordless power system series are ideal for small to medium-sized lawn areas. Steer around obstacles such as bushes and trees with little noise and no emissions. The engines with direct drive use energy very efficiently and feature high area capacity. The 36 V lithium-ion batteries are compatible with all tools in the STIHL COMPACT cordless power system.